Staying motivated and productive during your 8 hours in the office can sometimes prove to be a challenge. Prolonged hours of sitting might make you restless, hamper your creativity and lower your defence against stress. Your health is also at risk. Apart from the obvious strain in your posture, shoulders, arms and wrists, staying sedentary can lead to more serious health issues like heart damage, diabetes, muscle weakness and poor digestion. The good news is… there are chair exercises you can do from your workspace! Physical exercise’s numerous benefits include improved flexibility, increased energy and endurance. Emotionally, physical movement helps to reduce stress and tension. Mentally, it boosts brain function- making memorizing, thinking and concentrating easier. Start by calming your mind through repetitive deep breathing: inhale as if you are smelling the flowers in front of you, and exhale as if blowing out a candle in front of you. Practice this healing breathing technique several times before starting with the stretches. You feel yourself starting to relax already, aren’t you? 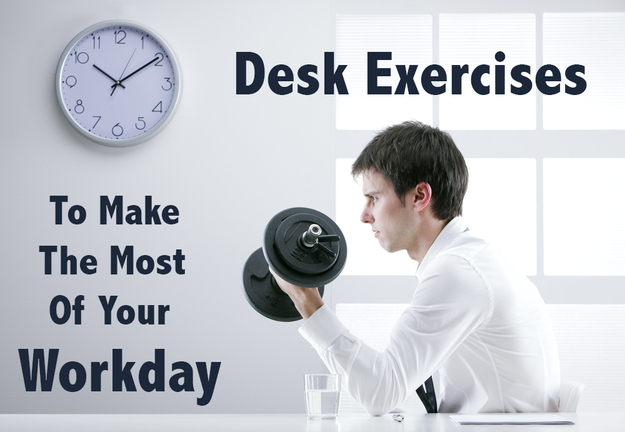 Here is a list of exercises that you can do from your office chair. And don’t worry, we handpicked them to be sure that they will not be distracting to your colleagues. This is the perfect warm-up pose to achieve balance and release tension from the upper body, while strengthening the core muscles. Allows you to open your chest and focus on your breathing. Sit up with your back straight. Roll your shoulder blades back and down, arms relaxed on your sides. Pull your abdominal muscles toward your spine. Make sure your knees and feet are facing forward. Inhale and raise your arms up- shoulder width apart, palms facing each other, shoulders down. Continue engaging your abdominal muscles, lift your chin up and keep your gaze on the ceiling. Hold pose for 5 – 10 breaths. This stretch is beneficial to your strained wrists and the middle of your upper back (the area between the shoulder blades). It prevents carpal tunnel syndrome. Sit up tall and proud. Roll your shoulder blades backwards, hands resting lightly on the chair, on your sides. Contract your abdominal muscles toward your spine. Keep your knees and feet facing forward, your feet planted firmly on the floor. Extend out your arms in front of you at 90 degrees angles, palms facing each other. Place your right arm under your left and press the backs of your palms together. Continue to keep your back straight. Inhale and exhale. On exhale, tuck your chin to your chest. Feel the stretch on the back of your neck. Take 5 – 10 deep breaths. Release pose and alternate the position of your arms. Repeat for another 5 – 10 breaths. Keep your heart happy- backbends open up your chest and promote the feeling of love, security and compassion. They also improve blood and oxygen circulation and regulate the endocrine system. Sit with your back straight, keep your shoulders and belly relaxed. Place your arms behind your back and interlace your fingers, your knuckles pressed against your seat. Arch your upper spine so that your chest lifts upwards. Lengthen your arms and press your knuckles further down your seat, roll shoulders away from your ears. While maintaining this pose, take 5 – 10 deep breaths. This exercise works your shoulders and improves your posture. Sit up tall and straight, keep your shoulders and belly relaxed. Raise your arms straight out to your sides, to form a T-shape. Press your shoulder blades together. Keeping your arms extended with palms facing up, do 20 forward circles with your arms. Keep your arms straight. Flip your palms to face down and do 20 forward circles with your arms. Turn palms up again and do 20 backward circles with your arms. Flip palms to face the floor again and do 20 backward circles with your arms. Repeat for 2 more sets. This easy movement improves blood circulation on hips, thighs and legs! Sit on the edge of your chair with your palms pressed lightly on the seat beside your buttocks. Plant more feet on the floor. Inhale and then on exhale, extend your right leg straight out. Hold for 3 counts and then lower back to the floor. Repeat 10 times. Do the same thing with your left leg. This detoxifying pose is good for the spine, abdomen and the obliques. Start with right twists- move your left shoulder forward and your right shoulder back. Place your left hand on the arm or right side of the chair and your right hand on the back of the chair. Gaze over your right shoulder. Keep your hips neutral and your knees and toes facing forward. Take 5 – 10 deep breaths. With each exhale, twist deeper towards the right side. Release pose and do it on the other side for another 5 – 10 breaths. Okay, this one is fun! Remember when you were a kid and you liked sliding along on office chairs? Works the back of your thighs too! If you have a chair with wheels, sit with your back straight, holding the sides of the chair. Extend both legs forward, toes up and heels on the floor. Press your heels into the floor, bend your knees and bring your chair forward to your feet. Extend your legs again and repeat. This complementary pair of poses improves spinal flexibility and relieves tension on the back, neck and shoulders. Keep your back straight. Roll your shoulder blades backwards, hands resting lightly on the chair, on your sides. Pull in your belly button to your spine. Make sure knees and feet are facing forward, feet flat on the floor. Cow pose: Inhale and arch your back, pulling your chest forward and upward. Focus your eyes on the ceiling. Cat pose: Exhale and round your spine. Let your head drop forward. Tuck your chin to your chest and roll your shoulders forward. Alternate between the cow pose and cat pose, breathing in and breathing out for 5 more sets. Almost similar to the yoga Child’s Pose, but done on your chair, instead of a mat. Restorative yoga poses calm your entire body and mind as you prepare to go back to your tasks. Cross your arms and place them on the desk in front of you. Lean forward and rest your head on your crossed arms. Close your eyes. Inhale and exhale 5 – 10 times. Release and go back to your sitting position. That was just the well-deserved break you needed to boost your productivity! Do it everyday, at least once a day, and let these exercises work for you- physically, emotionally and mentally. If you need additional help with your exercises, it’s always helpful to hire a FitnessTrainer as well.